Julian Swindell found the plans for this Portuguese-style dinghy, NELLIE GRACE designed by Hannu Vartiala of Finland, who has these plans available for free at his website, koti.kapsi.fi/hvartial. Julian lengthened the design from 5' to 7', with a 3' beam, big enough for his son Patrick and girlfriend Holly to test it out the Stroud Water Canal in Gloucestershire, England. 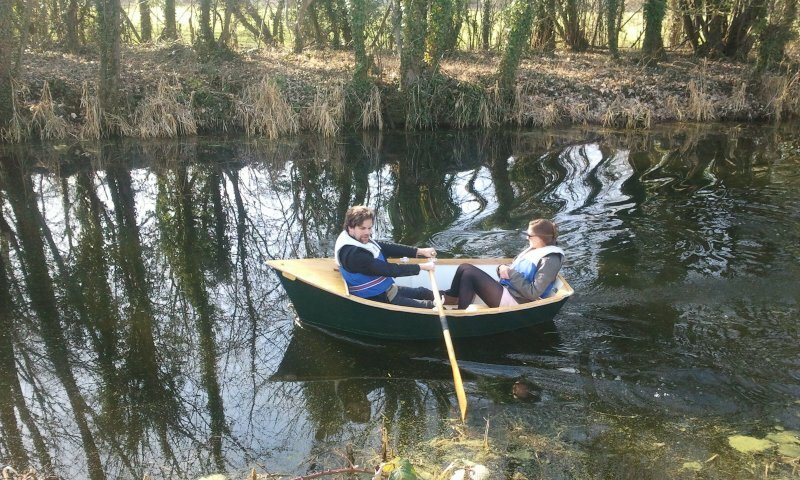 Julian built the boat last autumn from two sheets of plywood and a sale bundle of softwood. He held it together with epoxy and Julian writes that it "seems strong as an ox, as it fell off the roof rack and just bounced!" NELLIE GRACE will serve as a tender for Julian's bigger boat, DAISY GRACE, in Poole Harbour on the south coast of England.